The Boyfriend and I on our way to the Halloween party. The Boyfriend and I had so much fun at last year's Halloween party that we decided to go all out again this year. This might become "a thing" until we are really too old and boring to dress up. This year, The Boyfriend wanted to go as a punk rocker or an '80s rock star. I had no idea what I wanted to wear until I saw an Alice in Wonderland costume and fell in love with it. Shopping for our Halloween costumes and accessories is usually a big part of the fun, and we had a hilarious time going through the many costume stores in Taipei and trying on different ridiculous things. On Saturday, we joined our friends at the same party we went to last year and had an absolute blast. My best friends from South Africa were visiting us here in Taiwan, and it was wonderful that they were able to join us for the Halloween party. We danced until 3 am and then went to one of our favorite 24/7 restaurants for breakfast. It was a great night, but I just wish I had taken more pictures, as I saw some really creative and original costumes at the party. Did you dress up, or are you dressing up, for Halloween this year? Thanks, Robin! :-) Did you dress up for Halloween this year? Wow! That looks really fun! Wat moet ons volgende jaar dra? aaaah you look so fabulous in your Alice In Wonderland costume Leisl! Pretty! And your bf totally rocked it! 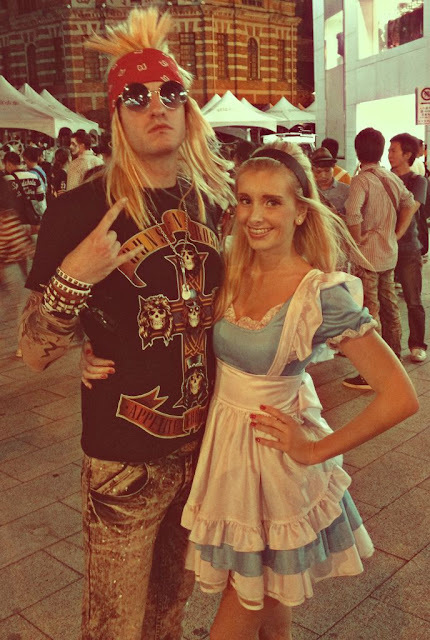 I love your Alice costume! You look lovely :-) just like Alice! I hope you had a wonderful time!